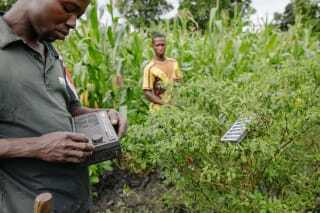 Harvest predictions, and access to loans, supplies and tools are now bundled up into one technology package, making sustainable agriculture for these farmers just a mobile minute away. Far-reaching and fast, the text message service quickly went from novelty to vital instrument. MUIIS is “a tool as much as my rake is. I can hardly do without it now,” Eria says. He continues: “I made some mistakes in the past that could have cost me my livelihood” – mistakes that farmers are much more likely to avoid when equipped with the information supplied by the text message service. In Eria’s district of Luweero alone, some 42 farmer groups and more than 4,300 farmers benefit from the service, through a number of activities. Nationally, 234,000 farmers are taking part in the MUIIS project. The local farmers’ association ZAABTA (Zirobwe Agaliawamu Agribusiness Training Association) acts as a hub for subscribers to the service, walking them through the process of creating a digitalised profile of their farming activities and progress. Knowledge is essential if banks and financial institutions are to provide farmers with the capital they need to maintain and grow their operations; historically, however, record-keeping has not been a strong-suit of Africa’s agricultural sector. Digitalisation is helping to change this, with the data gathered by MUIIS Service Agents (MSAs) being accepted as collateral for loans. “Farmers need to buy supplies, like fertiliser or pesticide. But we need it before harvest time. If the bank knows we are using a service that is accurately estimating our yield, and that we use resilient seeds, then they feel safer lending us money,” says Eria. As well as capital, subscribers to the service bundle gain structural safety-nets with entitlement to insurance. “Climate change has affected our methods,” Eria states. Not only a user of the service, he is also one of 200 MSAs in the country. “I want to be part of climate-smart agriculture,” he says. “Three years ago, that plot,” he says, waving his hand to point out his cornfield, “produced one-third of what it does today.” Currently, his plot yields 10 t of corn – one of the commodity crops targeted by the MUIIS project – compared to the 3 t it yielded before he began using the service to manage his cultivation. “Now I know when to plant, what to plant and the varieties adapted for the weather conditions,” Eria says. At ZAABTA, Kalamzi Kaamu – who heads Nokia Farming, the association’s mobile-payment office – points to a computer monitor and explains the benefits of more in depth farmer-profiling. 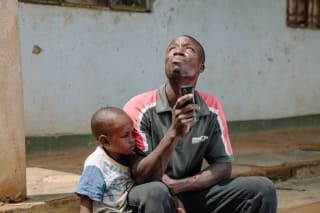 On the screen, a spreadsheet maps digitalised farmer data, which shows that 617 bundle-subscribed farmers who receive the text message service work 1,980 acres of land. The fee farmers pay for the service is based on acreage. Since the cycle of the agricultural world means that their returns will be visible only at the end of the season, there is also a ‘loan’ column in the spreadsheet. Farmers’ transactions are registered on a ZAABTA account, and by the end of the season their loan has already been calculated and deducted from their earnings. Thanks to projects like MUIIS, Eria says, the “knots” that made farming challenging — monitoring crops, ensuring better production and collecting information for financial institutions — are being unraveled.